Breakneck gunplay in bloodstained neon corridors. Wield 35 different weapons - from shotguns and assault rifles to katanas and lead pipes - everything is at your disposal. Set in an alternative 1989 Miami, you will assume the role of a mysterious antihero on a murderous rampage against the shady underworld at the behest of voices on your answering machine. 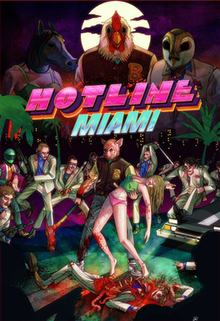 Hotline Miami’s unmistakable visual style, a driving soundtrack, and a surreal chain of events will have you question your own thirst for blood while pushing you to the limits with a brutally unforgiving challenge.